A healthy and easy recipe that everyone in your family that will love! Take 2 chicken breasts and flatten until Â½ inch thick then cut into nugget size pieces. Next in a bowl mix: 1 egg, 1 Â½ Tablespoon of Spicy Mustard, 1 Tablespoon Dried Oregano, 1 Tablespoon Chili Powder, 1 teaspoon Ground Garlic and Onion Powder, Â½ teaspoon Black Pepper, and Â½ teaspoon Salt. In another bowl pour Â¾ cup of Panko Flakes. 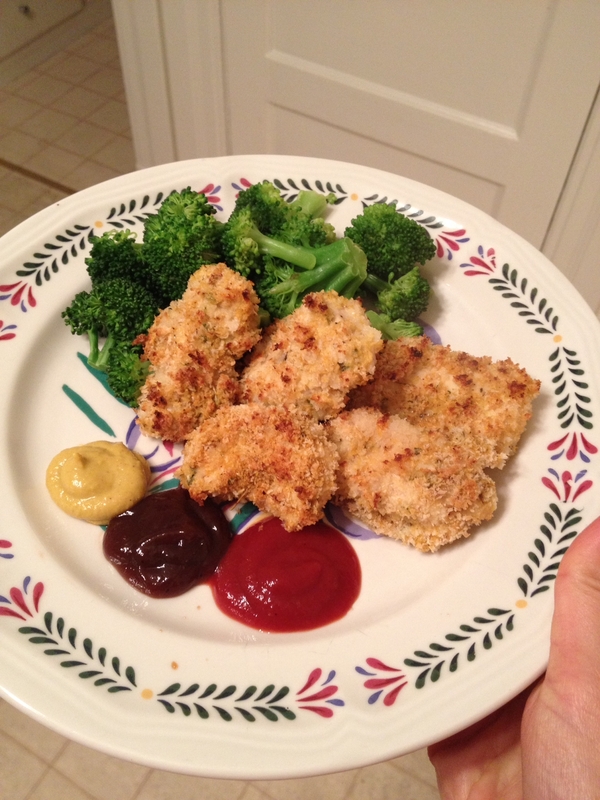 Dip chicken nuggets into egg mustard mixture than dip into panko flake bowl. Place on PAM sprayed baking sheet and bake at 450 for 14 minutes. You can broil the last minute to get a crispy brown color. Enjoy!